Current approaches to the problem of inferring network connectivity from spike data [1, 2] make a stationarity assumption, which is often not valid. Here we describe a method for inferring both the connectivity of a network in the presence of nonstationarity state and the time-dependent external drive that causes it. We have applied this method, as well as conventional ones assuming stationarity, to data sets from (1) the stochastic model itself, (2) a realistic computational model of a small cortical network, and (3) salamander retina under visual stimulation. In all three cases, we find that if we perform the reconstruction assuming stationarity, the algorithms effectively invent fictitious couplings to explain stimulus-induced correlations: The couplings in the network are systematically overestimated. The nonstationary treatment outlined above enables us, for sufficient data, to find both the correct (weaker) couplings and to extract the time-dependence of the external input. 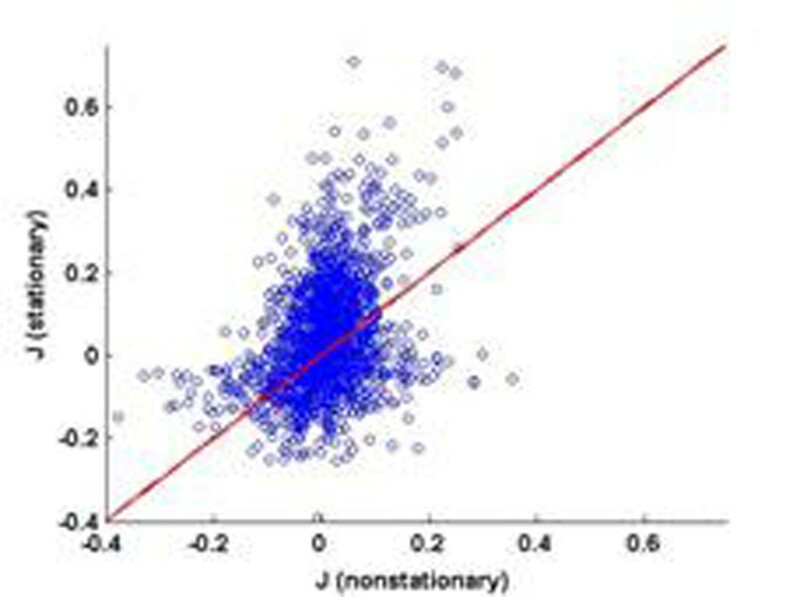 To illustrate this, figure 1 shows the J ij s found using the nonstationary algorithm plotted against those found using the stationary one, based on spike trains of 40 salamander retinal neurons stimulated by 120 repetitions of a 26.5-second clip from a film.. The mean J ij is reduced, from 0.0471 to -0.0028, and the large positive J ij s found assuming stationarity are reduced by a facto of 2-3 when nonstationarity is taken into account. Couplings found assuming stationarity (y axis) plotted against coupling found not assuming stationarity (x axis) for data from salamander retina. We thank Michael Berry for providing the salamander retinal data.